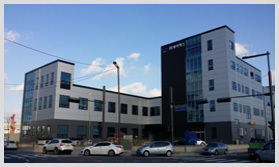 A-MECS is the leading Color Sorter manufacturer in KOREA having overseas networks around the World and we cooperate with our agents and distributors creating world’s premium products. We are developing advanced sorting solutions adopting new high-technology and the latest sorting method with new series of product line to meet customer satisfaction in both food processing and non-food industries such as recycling plastics. We provide customers with a wide range of options and applications according to customer’s requirements for sorting grain & seed food products like White Rice, Parboiled rice, Dal/Pulses, Wheat, Rye, Bean, Sunflower seeds, Pumpkin seeds, Resin, Plastics etc. Product samples are analysed in our laboratory to be reported according to customer’s requirements. We give our opinion on the products and recommend the most suitable model and options considering their capacity and contamination level of raw materials. A-MECS is improving Color Sorter in order to provide the best sorting solutions for our customers aiming to enable the customers to get high productivity and quality products with good performance. Our overseas network of branch offices and agents in 31 countries covers Asia, Europe, America and Africa. We serve A/S through our networks and support our partners and end-users getting their feedbacks which make us to improve better services for customers.